Soft tissue injuries can occur in a variety of ways such as a car accident, slip and fall accident, boating accident, recreational vehicle accident, dog bite or any other impact. The problem with soft tissue injuries is that they are difficult to prove as the injury will not show up on an x-ray, and will be difficult to see on a scan or MRI. Getting an MRI may show the injury, but getting an MRI in Toronto or anywhere in Ontario is very difficult. The OHIP system is strapped for resources, and there is a long waiting list for MRI services. You will likely be able to get an MRI more quickly driving to the United States than waiting for one in Ontario. Soft tissue injuries can make it very difficult for the accident victim to lead a normal life. Dealing with constant, throbbing pain which did not exist before is not easy. The pain can radiate from one part of the body to the other. The pain can render an accident victim or disability claimant totally disabled from getting back to work or running a normal life. Activities of daily living such as housekeeping and home maintenance might be compromised as as result of the soft tissue injury and the associated pain. The pain from a soft tissue injury might be managed by medication, but there are times when medication doesn't work, or your body has grown used to the pain medication. You may not want to grow reliant on taking stronger pain medication such as Morphine, Oxycodone, Percocet or Tylenol #3. Who wants to be taking that sort of stuff anyways? Coping with the pain is never easy. It can result in depression, moodiness, loss of energy, fatigue, anxiety, stress, loss of concentration and overall despair. The lawyers of Goldfinger Law understand that soft tissue injuries can be all encompassing and very frustrating to accident victims. Unfortunately, there is no quick fix for these problems. Sometimes, it just takes time to get better. Other times, the pain is serious and permanent and simply won't go away. When your pain is simply too much to handle as a result of a car accident or other serious trauma, the personal injury lawyers of Goldfinger Law are here to listen to your problems, and ultimately help you. When you are the victim to a soft tissue injury, it's important to have a family doctor who understands your injury and who is sympathetic towards your pain. The management of soft tissue injuries is very difficult. It requires a multidisciplinary approach which might entail you being treated by a physiatrist, orthopaedic surgeon, psychiatrist, physiotherapist, occupational therapist, social worker, psychologist or a rheumatologist. The lawyers of Goldfinger Law can help ensure that you get the treatment you need not covered by the OHIP system for your soft tissue injury to make sure that you get better to help restore some dignity for your life. Sometimes these injuries come as a result in a workplace accident. Goldfinger Law can assist you with your long term disability claim or short term disability claim if you're entitled to such benefits. Insurance companies are very good at taking your premiums, but not so good at paying our your benefits. Let the personal injury lawyers of Goldfinger Law do what we do best and that's getting compensation for accident victims and disability claimants. 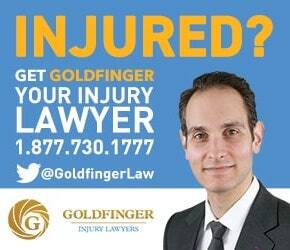 If you are suffering from a soft tissue injury as a result of an auto mobile accident or other trauma, or you're entitled to disability benefits, call the lawyers of Goldfinger Law for your free consultation. The sooner you call the sooner we can help you in getting the compensation you deserve so you can get back to leading your life with dignity.